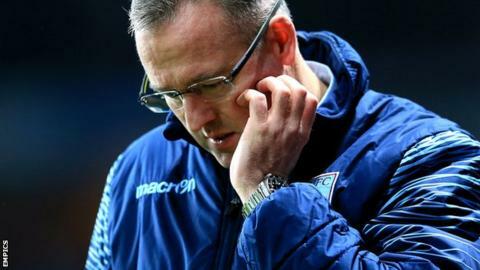 Sacked Aston Villa boss Paul Lambert says managing the struggling West Midlands club turned out to be "the toughest challenge" of his career. Lambert, 45, left Villa on Wednesday after the club slipped into the Premier League relegation zone. In 25 top-flight games this season, they have managed just 12 goals. "The club's owner, Randy Lerner, warned me that I was embarking on the toughest challenge of my working life and he was not wrong," said Lambert. In a statement, the former Norwich City boss added: "But I have never stepped away from hard work and I put my heart and soul into the job from my first day until my last." Lerner said in a statement of his own on Villa's website that Lambert had "arrived with a fresh view and a proven style and track record" and he had hoped the club "would find its footing and strengthen" during the Scot's tenure. The American added: "It is our hope that given the quality, leadership and team spirit that we can rise to the occasion for the remainder of the season." Tuesday's 2-0 defeat at fellow strugglers Hull City marked the end for Lambert's 31-month tenure at Villa Park. First-team coach Scott Marshall and goalkeeping coach Andy Marshall are now in temporary charge with 13 league matches remaining. Former Spurs boss Tim Sherwood and United States coach Jurgen Klinsmann have been linked with the job on a full-time basis. "Someone needs to go in there with a bit of freshness, mix things up a little bit and just try something new," said out-of-favour Villa striker Darren Bent, now on loan at Derby. "They are in a tough position. If someone comes in with fresh ideas, new tactics, it might just give the whole place a lift, including the supporters, the staff, everyone associated with the club." Bent fell out with Lambert and has been on loan to a series of clubs. "Me going back to Aston Villa is out of my hands," added Bent. "I am a Derby County player at the moment and I am enjoying my time here." Lambert said he was "extremely proud" to have managed Villa. "My initial remit was to conduct a massive overhaul of the playing squad, lower the overall wage structure of the playing staff and achieve this whilst keeping the club in the Barclays Premier League," he added. "There was also a concerted effort to purchase and develop younger players who would provide a solid footing for the football club to move forward and enhance the value of the playing squad in the future." Lambert, who was appointed in June 2012, said he owed "a great debt of gratitude" to many people at Villa, among them his coaching staff, Lerner and former chief executive Paul Faulkner. "To the players, my sincere thanks to each and every one of them," added the former Champions League winner, who was victorious in that competition with Borussia Dortmund in 1997. "They are a fantastic group of players and I wish them every success for the rest of their playing careers. I hope to see many of them achieve great things in the game. "Finally, I pay tribute to the supporters who are among the most passionate I have ever encountered. "They rightly hold huge expectations for their beloved football club and I sincerely hope they are rewarded with the success they deserve. "I completely understand their frustrations and always shared their view that the football club is too big not to be competing at the top end of the table. I hope that can happen." He added: "You never stop learning in football management and I certainly believe the invaluable experience from my time as Villa manager will prove hugely beneficial in the next stage of my managerial career." "Lambert clearly has no hard feelings towards Randy Lerner, whom he praises for his support and friendship throughout, but he doesn't namecheck Tom Fox, Villa's chief executive ,who recommended his sacking to Mr Lerner. Instead, Lambert refers to Mr Fox's s predecessor, Paul Faulkner, mentioning his 'unstinting integrity and constant dignity'. "Paul Lambert learned of his sacking by phone yesterday afternoon and that's why he pointedly didn't refer in his statement to the man who made that call, Tom Fox, Villa's chief executive." "The new Aston Villa manager will be recommended by Fox, with the owner Randy Lerner prepared to rubberstamp his decision. "Mr Fox will take soundings from Villa's director of recruitment, Paddy Reilly, and an inner circle of trusted colleagues. Coaching expertise will be essential - Villa were short in that area during Lambert's tenure - and they won't be put off if their preferred candidate's with another club. Time is on Villa's side. Their next Premier League game's not until a week on Saturday - home to Stoke - but Mr Fox will want a swift appointment."